WE SPECIALIZE IN - BANKRUPTCIES - LOW CREDIT SCORE - CHARGE OFFS - COLLECTIONS - BRUISED CREDIT - FIRST TIME BUYERS - WE ARE YOUR FINANCING SOLUTION- WE ACCEPT ALL APLICATIONS!! ONE OWNER, BLUETOOTH HANDS FREE, REAR BACK UP CAMERA, POWER MOONROOF / SUNROOF, FLORIDA OWNED VEHICLE, 2 KEYS AVAILABLE, Black/Gray Cloth. Recent Arrival! 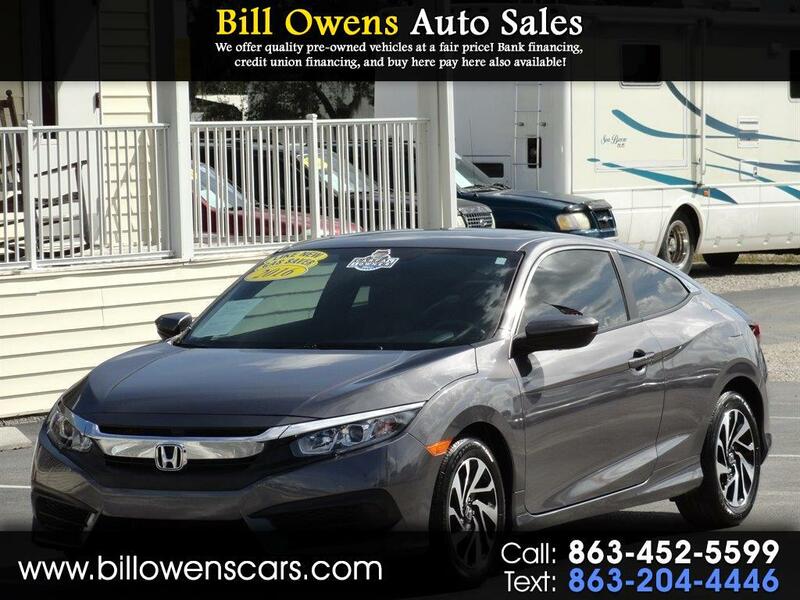 30/41 City/Highway MPG Aegean Blue Metallic 2016 Honda Civic 2D Coupe LX-P 2.0L I4 DOHC 16V i-VTEC CVT FWD At Bill Owens Auto Sales we are proud of the quality used cars we sell and our dedication to serve the needs of our customers. This is reflected in the amount of repeat business we receive. Whether this is your first purchase with us or one of many that you’ve had, you can count on our dedicated sales staff to make it the best buying experience possible. Awards: * 2016 IIHS Top Safety Pick+ (When equipped with honda sensing) * NACTOY 2016 North American Car of the Year * 2016 KBB.com Brand Image Awards 2016 Kelley Blue Book Brand Image Awards are based on the Brand Watch(tm) study from Kelley Blue Book Market Intelligence. Award calculated among non-luxury shoppers. For more information, visit www.kbb.com. Kelley Blue Book is a registered trademark of Kelley Blue Book Co., Inc.